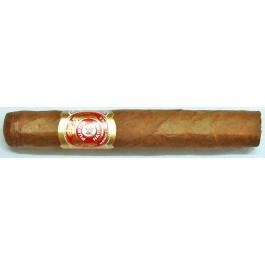 The Punch Petit Punch, discontinued since 2009, is a mild cigar of Perla format, 4" (102mm) long, of 40 ring gauge, and comes in a 25 cigars box. This cigar is the small secret of connoisseurs. A rare production; according to the official references, it's only available in Cabinets of 50. This year, we have discovered a small batch of pressed boxes of 25 (1/40). This creamy minuto is excellent while taking a small risteretto. You may also enjoy this vitola with a glass of Champagne. Together with its twin brother, the Petit Punch de Luxe, they are a pair of authentic Perlas, small but exquisitely made. If you smoke these gauges you'll become a fan and you will have made an excellent choice. The only difference between the two commercial names is their presentation.